North Korean leader Kim Jong Un (R) gives field guidance during a visit to a construction site in this undated photo released by North Korea's Korean Central News Agency (KCNA) in Pyongyang, Sept. 14, 2015. North Korea appears to be intensifying nuclear and ballistic missile development efforts that could lead to further international sanctions against the Kim Jong Un regime. 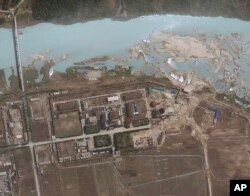 North Korea’s state controlled media KCNA said Tuesday the country’s main nuclear complex in Yongbyon was in full operation. The reactor was shut down in 2007. However following North Korea’s third nuclear test in 2013, Pyongyang said it would restart the facility. Some military analysts, studying satellite images of the complex, asserted back in January that the nuclear bomb fuel reactor was again operational. But until now there had not been any official confirmation. North Korea's National Aerospace Development Administration indicated Monday it is preparing for a possible satellite launch that would likely utilize ballistic missile technology. "The world will clearly see a series of satellites of [North] Korea soaring into the sky at the times and locations determined by the Central Committee of the Workers' Party of Korea," KCNA reported. Outside analysts have speculated that North Korea has been planning a long-range rocket launch, possibly in October, to celebrate the 70th anniversary of the ruling party. North Korea maintains that such launches are for peaceful, non-military purposes. But the United States and its allies say they are mainly aimed at developing long-range ballistic missile technology, which is banned under United Nations Security Council resolutions. The announced nuclear enrichment and rocket launching developments come weeks after a border incident threatened a major conventional military conflict between the two Koreas. Emergency high level inter-Korean talks resolved the standoff and both sides promised to hold reunions for families separated since the Korean War divided the peninsula in 1950, and to pursue further talks to reduce regional tensions. An additional factor, according to Korea analyst Daniel Pinkston, a visiting research fellow at Babes-Bolyai University’s Conflict Studies Center in Romania, is that South Korea holds a significant advantage in modern conventional weapons over the North’s cold war era arsenal. “I think at some point the North Koreans realized their weakness in this strategic interaction and they were looking for a way out,” said Pinkston. North Korea maintains it needs nuclear weapons to defend itself against a possible U.S. invasion. But these new nuclear and missile launch developments could prompt calls for new international sanctions, further alienate Beijing from Pyongyang and undermine recent inter-Korean engagement efforts. FILE - satellite image provided by GeoEye shows the area around the Yongbyon nuclear facility in Yongbyon, North Korea. While Kim Jong Un has maintained his isolated and defiant stance in developing a nuclear weapons and ballistic missile program, South Korean President Park Guen-hye has been an increasingly reassuring and engaging force in the region, especially with North Korea’s key ally China. President Park has visited China numerous times, most recently attending celebrations in Beijing for the 70th anniversary of the end of World War II. Kim Jong Un was conspicuously absent from the event and has yet to meet with Chinese President Xi Jinping. As a key ally of the United States, the South Korean president received some criticism for attending the Chinese military parade. Some suggested it demonstrated Beijing’s growing influence over Seoul. But Korea analyst Robert Kelly, an associate professor at Pusan National University in South Korea, said it is President Park who is pulling President Xi closer through personal diplomacy and increasing economic ties. “She’s over there talking to him all the time trying to build this relationship and the long term idea is to sort of slowly pull the Chinese away from the North. It’s very smart. The best thing she’s done in her presidency in my opinion,” Kelly said. FILE - South Korean President Park Geun-hye speaks during a luncheon meeting with members of charity groups at presidential house in Seoul, South Korea. Park will visit Washington next month to highlight the strong military alliance between South Korea and the United States. Pinkston says Washington and Seoul are working towards the same end -- the peaceful unification of a democratic Korea. But U.S. officials are still wary of signs of tightening relations with China, such as Park’s attendance at the Beijing military parade. “Certainly it made some people in Washington very uncomfortable, or suspicious, about Chinese intentions. But for Park, her position is quite different,” Pinkston said. 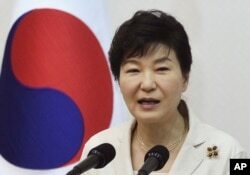 Park has also recently indicated a willingness to reduce tensions with Japan over historical issues. The South Korean president had refused to meet with Japanese Prime Minister Shinzo Abe until he directly apologized for the hundreds of thousands of Asian women who were forced into prostitution as so called “comfort women” by the Japanese military during the war. But in a speech commemorating the 70th anniversary of the end of World War II, Park said she would accept Abe’s promise to uphold apologies by past Japanese leaders, including the 1993 Kono Statement that offered apologies and remorse to comfort women. South Korea, Japan and China have begun planning for the first trilateral summit since 2012 to be held later this year.